This one is certain to end up on my skin one day, and I'd rather have it sooner than later. It's been on the list ever since my first tattoo, and has only been postponed every time because I'm not quite sure yet how I want it. 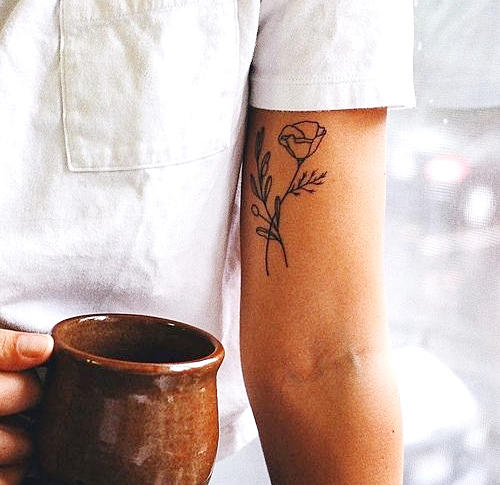 I really have a thing with roses going on for a while now, so I love the design on the left, but sometimes I'm rather more keen on the simple design (the logo in all black or red with a black outline, and a bit smaller), perhaps with the next tattoo idea right underneath it. For those of you who don't know; it's the symbol of the Rebel Alliance in Star Wars, so obviously it has this more-often-than-not geek written all over it. One that I've had on the list even before David Bowie, one of my (and lots of people's) all-time favourite artists, passed away last year, and I think it would fit perfectly underneath the Rebel logo I already mentioned. It's such a simple, yet genius lyric and I think everyone can really identify with it at some point in life. The font is debatable, but I actually already like the typewriter style in the picture. Ferns symbolise sincerity towards others. It can also be a symbol of magic, fascination, confidence, shelter, discretion, reverie and a secret bond of love. So, well. Consider me sold. The fern leaf would obviously still win over these, but I'm slightly tempted to just get all of these spread over a couple of years, THAT's how pretty I think these designs would look. Last but not least, I have a teensy tiny obsession with moth tattoos and I can't quite decide what I think is prettiest: black designs or the traditional design in the middle. I never thought I'd consider a big tattoo, but let's just say that that preference has shifted lately. Just like the rose in that Rebel Alliance symbol at the beginning of this post, I find myself pretty drawn to traditional designs nowadays, as well. Now if only I had the budget for one of those, haha! Q: do you have tattoos? Show 'em off or share your wishlist in the comments!